Caskudas are insects similar to cockroaches, but worse. Native to Acontecimiento, they are big, reproduce at full speed, can fly, have a very resistant shell and are immune to almost any legal insecticide. Overall, an absolutely hateful, foul and disgusting nightmare. The first time that PanOceanian troops suffered an attack from the Concordat Armoured Jump Operators, they reminded them so much of those disgusting creatures that they baptized them with the same name. Caskudas are T.A.G.s equipped with trans-atmospheric flight units that can be launched from atmospheric aircraft or from planetary orbit. During re-entry to the atmosphere, the acceleration can surpass 6Gs. The adaptable geometry of Caskudas can assume complex aerodynamic models to maximise speed and reduce friction. From thirteen miles of height, their repulsors are activated to descend at supersonic speeds and then gradually diminish to the subsonic. Stabilizing fins erupt from their backs with the aim of adapting to the higher density of atmosphere. Their entry to the battlefield could be easily mistaken for a meteorite shower until they land… In fact, Caskudas do not actually land, even though they could if they wanted to. 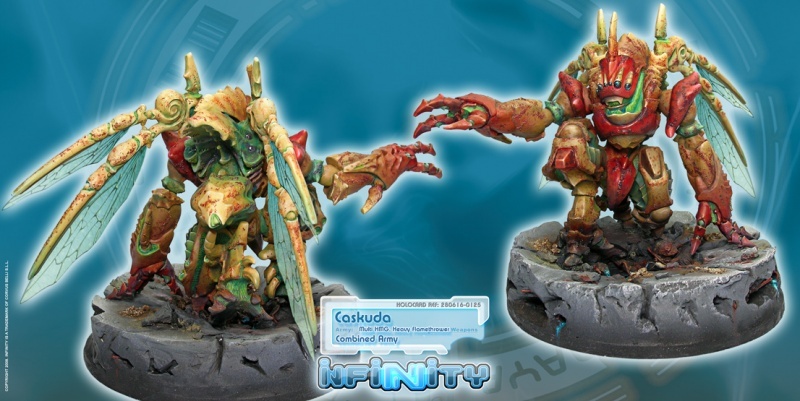 Caskudas crash and explode all over the battlefield, trying to spread confusion in the enemy ranks. So, the sequence is this: first you feel the impact of an artillery projectile, then the projectile arises from the ground and starts shooting everybody. How would you feel if the enemy bombs you with heavily armoured T.A.G.s?